Mighty fine Tuesday today, everyone! 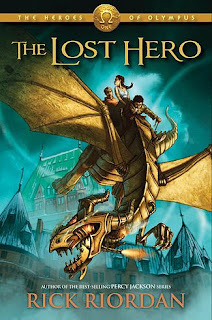 As promised in my post yesterday, I shall write a review for Rick Riordan's The Lost Hero. Beware, spoilers ahead! I used to love reading up Greek mythology; the legends of each god and titan are amazing. After waiting for three months for the book to arrive after my purchasing the series, I definitely think the wait was worthwhile. Upon reading the chapters in the life of the amnesiac Jason, I was hooked right in. I immediately fell in love with Riordan's writing style. The prophecy for the quest in the book. I can't believe I memorized it. I recognized most god names, but I learned more and what they really represent. Not only that, but I also recognized the name differences of each Greek god to their Roman aspects. And some facts about the gods, too, like how Athena and Artemis were virgins. I never loved Greek mythology more than before. I can't wait to begin The Son of Neptune and recognize more gods and goddesses. There's nothing about this book that I can dislike on. I just loved it. The time when Jason met his long-lost sister, Thalia, and the fact that gods can actually go insane (Aeolus), man. I'm eagerly waiting to read about Percy Jackson and Annabeth Chase. And I'm trying to learn of the seven in the Second Great Prophecy while fighting my urge to spoil myself. No regrets spending a hundred for the series. Note to self: come one week later after book is released so mother does not scold me. That's the end of my review. Summing it up: this book takes Greek mythology to a whole new level. Have you readers read the book yet? If you did, share what you thought of the first installment of Riordan's Heroes of Olympus series down in the comments below!